Explore Hawaii's Underwater World at the Maui Ocean Center featuring a mix of sixty indoor and outdoor exhibits that allow you to discover Hawaii's amazing marine life. The aquarium is home to one of world's largest collections of live Pacific corals and features marine life found only in Hawaii including sea turtles, sharks, rays, and much more. The layout of the Maui Ocean Center is shown below and from start to finish, I'd say a visit to the aquarium can be done in 2 hours, but if you like to move more leisurely you can spend half a day here and also enjoy the dining options onsite and nearby in Maalaea harbor and the gift shop. The best way to explore the Maui Ocean Center is to start at the Surge Zone and head into the first building featuring exhibits from the Living Reef. After exploring the exhibits in the first building, you'll make your way out into the Harbor Plaza where you'll find the onsite restaurant, Seascape, and have an opportunity to take a keepsake picture with a green screen background. 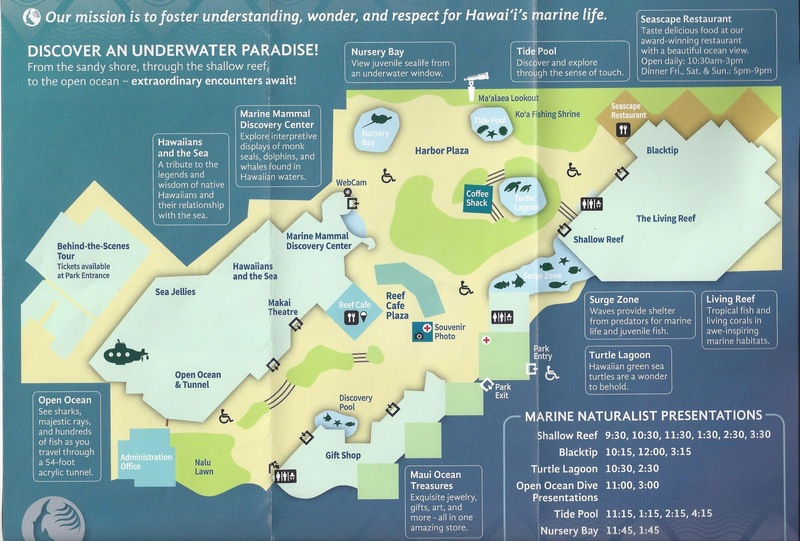 The outdoor exhibits to explore here include the Turtle Lagoon, Tide Pool, Nursery Bay, and the Ma'alaea lookout, great for capturing scenic shots. Next, you'll make your way into the last building that features a Marine Mammal Discovery Center, Hawaiians and the Sea, Makai Theater, Sea Jellies, and the Open Ocean and tunnel. In my opinion, the Open Ocean and tunnel is the best exhibit at the aquarium. Lastly, be sure to drop by the gift shop for exquisite jewelry, gifts, art, kids toys/books and much more. The Maui Ocean Center is open 365 days a year, from 9:00 am to 5:00 pm, with last entry at 4:30 pm. Tickets are $29.95 for ages 13 and up and $19.95 for ages 3-12. You can find discounted tickets online and at Costco. The Maui Ocean Center is a great aquarium for families looking to spend an afternoon exploring Hawaiian marine life and it is hard not to see why it is included as one of the “Top 25 Aquariums in the US” by TripAdvisor!